Hooked Hands is a street artist and doll maker working in Los Angeles promoting the ideas of equality and decent humanity while trying to sometimes make you laugh. 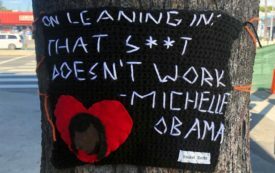 She tries to use the folksy art of crochet to make items that tackle current icons and issues to spark a conversation. She is also a librarian and a mama who will talk about books and her kid until you tell her politely to stop. 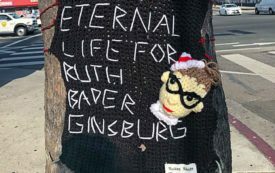 Long live Ruth Bader Ginsburg!